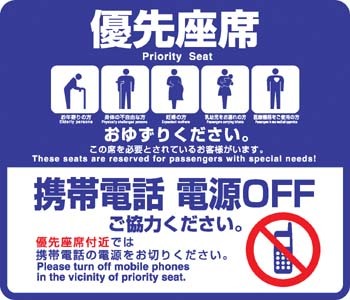 In Japan it is very common to see signs on trains that encourage/require you to turn off your phone on trains, or just near the priority seating areas. The thinking goes that the signals somehow affect passengers with pacemakers and potentially break/stop them. Is there any truth to this? Everyone seems to ignore the rules and I have never heard of any incidents related to it. Yes, in some cases. The risk seems to depend on the cell phone and pacemaker involved. Apparently there's no conflict in some cases, while there can be in other cases. The American Heart Association (ACA) does warn that some newer cell phones can make pacemakers less reliable. Given these risks, it makes sense that Japanese trains - which are notorious for having people cramped together - would warn about cell phones, as there's a lot of potential for someone with a pacemaker to end up smooshed against someone with a cell phone at minimal distance. But based on current research, cell phones would not seem to pose a significant health problem for the vast majority of pacemaker wearers. Still, people with pacemakers may want to take some simple precautions to be sure that their cell phones don't cause a problem. Cell phones: Currently, phones available in the United States (less than 3 watts) don't appear to damage pulse generators or affect how the pacemaker works. Technology is rapidly changing as the Federal Communications Commission (FCC) makes new frequencies available. Newer cellphones using these new frequencies might make pacemakers less reliable. A group of cellphone companies is studying that possibility. Bluetooth® headsets do not appear to interfere with pacemakers. Here, the ACA lists cell phones as a "device with risk". They also warn that newer cellphones might "make pacemakers less reliable". This is a clinical study trying to identify the effects of electromagnetic field generated by mobile phones that are currently used worldwide on transvenous permanent pacemaker function. In our study, we demonstrated the presence of such an effect without any doubt and found the total adverse effect rate as 5.5% in 679 pacemaker patients. Under certain conditions, mobile phones can cause temporary dysfunctions on pacemaker functions. It is highly probable that such adverse effects would be seen at a distance of 10 cm. Having a unipolar lead polarity increases the risk of being affected. The risk of being adversely affected is not different for single-chamber and dual-chamber pacemakers. Older generation pacemakers are under greater risk when compared to new generations. However, there is no need to panic. This effect is completely reversible and is not life-threatening except for the patients who are completely pacemaker-dependent. The temporary changes in the functions of the pacemakers are observed as ventricular triggering in dual-chamber pacemakers, and the entire dual-chamber pacemakers that are manufactured today have the mode-switch feature. Single-chamber pacemakers usually switch to asynchronous mode (VOO). The important issue is that there is a possibility of total pacemaker inhibition in patients who are completely pacemaker-dependent. To this end, when pacemakers are being implanted, the lead polarity should be bipolar if the patient does not have a rhythm of his own, and they should be informed about how to use the mobile phones safely. Some studies have shown that mobile phones can interfere with implanted cardiac pacemakers if a phone is used in close proximity (within about 8 inches) of a pacemaker. It appears that such interference is limited to older pacemakers, which may no longer be in use. Nonetheless, to avoid this potential problem, pacemaker patients can avoid placing a phone in a pocket close to the location of their pacemaker or otherwise place the phone near the pacemaker location during phone use. Patients with pacemakers should consult with their physician or the FDA if they believe that they may have a problem related to RF interference. Cell phones raise their output power when they're struggling to get signal, such as if they're in a train that's going through a tunnel or competing with other nearby cell phones. This raises the risk for higher exposure under such conditions. It's worth noting that this problem is similar to why cell phones are discouraged on airplanes, leading to an "Airplane Mode" to be put into most modern devices. Activating this mode causes the cell phone's antennas to turn off. Assuming that all antennas are turned off, or at least the main ones, then I'd expect this to significantly reduce the risk to nearby pacemakers. One complicating factor is that technology's rapidly changing, including the types, powers, and frequency of signals being used. This makes it hard to say with certainty that new devices, or devices that'll be out in a few years, won't pose new threats. Cell phones don't usually appear to cause major adverse reactions, despite having been proven to cause them in some cases. Some cell phone technologies are safer than others. 3G and BlueTooth technologies were noted as relatively safe. Newer pacemakers are generally believed to be safer with respect to these issues, though guidelines still urge caution. Signal power is a big deal. The signal needs to be powerful enough to cause an effect. How strong the cell phone's max output is. The AHA notes "Currently, phones available in the United States (less than 3 watts) don't appear to damage pulse generators or affect how the pacemaker works". What portion of its max the cell phone is working at. Usually cell phones increase power to improve signal. If the cell phone's not actively in use, it's probably lower. How far the pacemaker is from the cell phone. Electromagnetic radiation drops off with the inverse square law. This means that having the cell phone 2 inches away drops the radiation by a factor of 4 compared to having it 1 inch away. The FDA recommends: "Hold the phone to the ear opposite the side of the body where the pacemaker is implanted to add some extra distance between the pacemaker and the phone". Not the answer you're looking for? Browse other questions tagged physics safety radiation japan electronics .